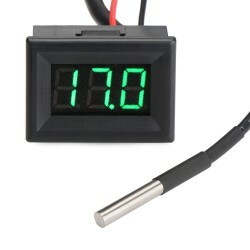 It is a Red/Blue/Green Led Display Digital Tester/ Digital Thermometer, Measuring Temperature Range:.. It is a 0.36 " Red/Blue/Yellow/Green LED Digital Thermometer,Measuring Range -55 to 125°c,Power Supp.. It is a Red/Blue/Yellow/Green Digital Thermometer,Measuring temperature Range -55 to 125°c,Power Sup.. It is a DC 12V to 5V step down converter, with USB mounting holes, maximum output current 3.6A, conv.. It's a Temperature Control Switch,Supply voltage: 5V,Output Capacitance: Max Current 5A, Max Power.. It is a Universal Car Charger Tester, Input Voltage: 12 ~ 24V, Output Voltage: 5V, ±5%, Output Curre.. It is a Red/Blue/Green Led Display Digital Thermometer/Temperature Tester, Measuring Temperature Ran.. It's a Temperature Control Switch,Supply voltage: 12V,Output Capacitance: Max Current 5A, Max Powe.. It is a Digital Thermometer/Dual display Temperature Tester, Power supply: DC4 ~ 28V, Operating temp..